Harriet Hobbs lives down the street on a farm at the edge of the marsh on a curve in the road on the way to Alec and Ann Marshall’s house. She calls her place “Ryder Beach Farm.” I call it paradise. I can’t say she lives alone on the farm, but she is the only human there full time. 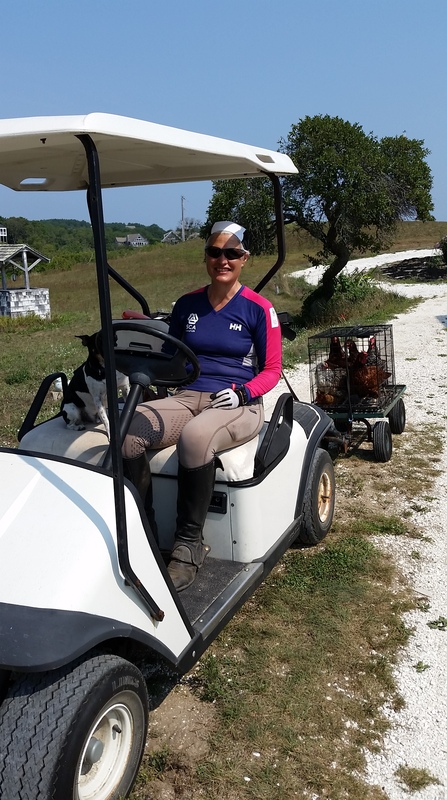 There are the 3 dogs- Frederica, Georgianna and Nelson who give you a heart attack as you come up the shell drive, 4 cats, 3 horses- Shot, Kadence and Gregor, and 13 chickens, all named. The setting is idyllic- flowers abound, shingled cottage farm house, large white barn, horse paddocks, flag pole, bee hives, the works. When most people see her spread they see an idyllic form of heaven. I see a well oiled machine of self sustaining ecosystem, the beauty of nature, the love and companionship of animals, good times and a ton of hard work, constant manual labor, and a bottomless money pit. But Harriet perseveres. Renaissance woman, Harriet is a real estate attorney and runs the farm herself. 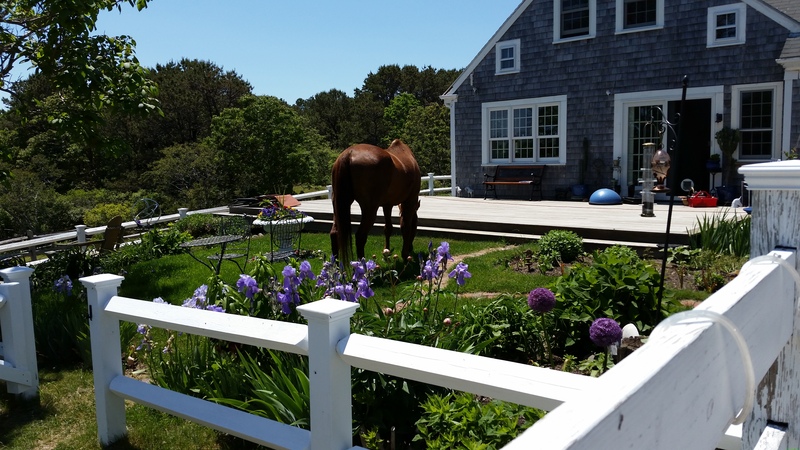 The horses keep her sane, mow the lawn and produce manure for the gardens. The goats eat the poison ivy, food scraps and are a constant source of entertainment. 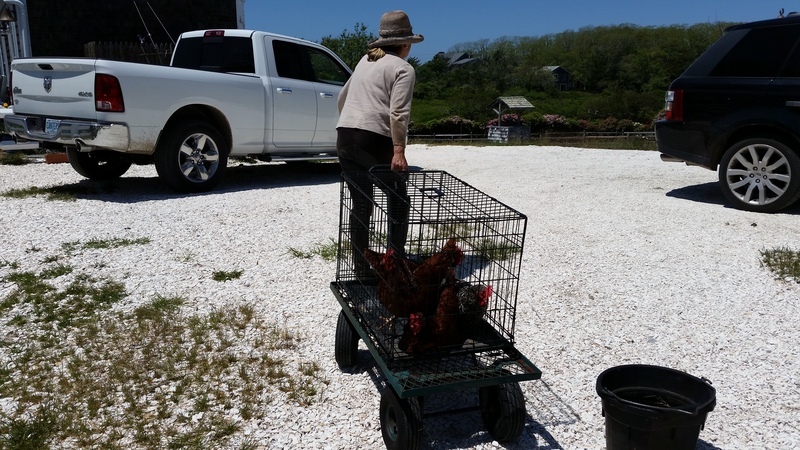 The chickens eat the ticks, food scraps, aerate the soil and produce eggs to sell and fertilizer for the gardens. The bees pollinate the flowers, the gold fish eat the algae in the horse water tubs (though not as well as Harriet would like.) The cats eat the mice and the dogs patrol for interlopers. The human makes money to pay for it all and does all the heavy lifting and has thumbs, very useful for opening cans and feed bags. She is the CEO, the groom, mucker, farm hand, landlord, maid, bottle washer. She can be found cantering in the surf at low tide in the morning and walking with 3 dogs and 2 goats on the beach at sunset. In between she’s moving chickens, checking in or cleaning up after guests and performing real estate closings and feeding everyone. In winter she digs out and drives to New Hampshire every weekend where she is a ski instructor. My hero. It’s always a treat to go for a ride with Harriet. She has 3 horses, magnificent beasts. I usually ride Gregor, a huge warm blood. She has them so well trained that when they see the bridle the put their heads down and open their mouths (Buddy I wish you could read!) Sometimes Harriet will ride Shot, who is 32 and looks and acts like he’s 12. He free ranges on the farm like a puppy, sometimes becoming quite the garden pest. 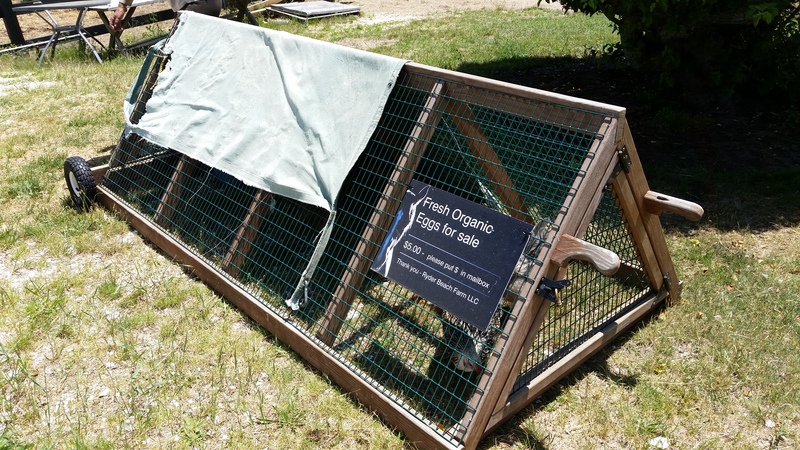 The other is a plastic dome on wheels with handles covered in zip tied chicken wire with a tarp for shade and a door. 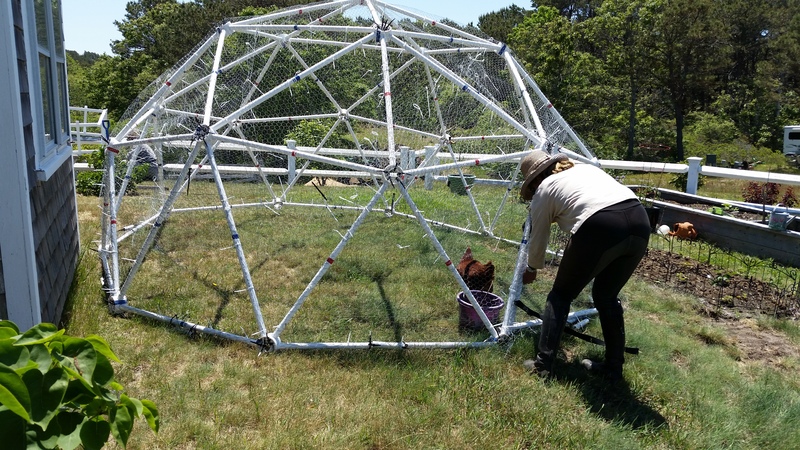 So how does one transfer a bunch of clucking chickens from a cellar room to an outdoor dome you ask? Why by golf cart of course! Harriet has a dog crate on top of a wagon that she attaches to her electric golf cart with a dog leash. She stuffs the chickens in one by one (some of them know their names and sit for her when she calls to them!) hitches up the cart then they make their merry way to the dome. Yesterday she let me drive the cart and even forgave me when I stepped on the pedal going forward instead of reverse and almost slammed into the barn. 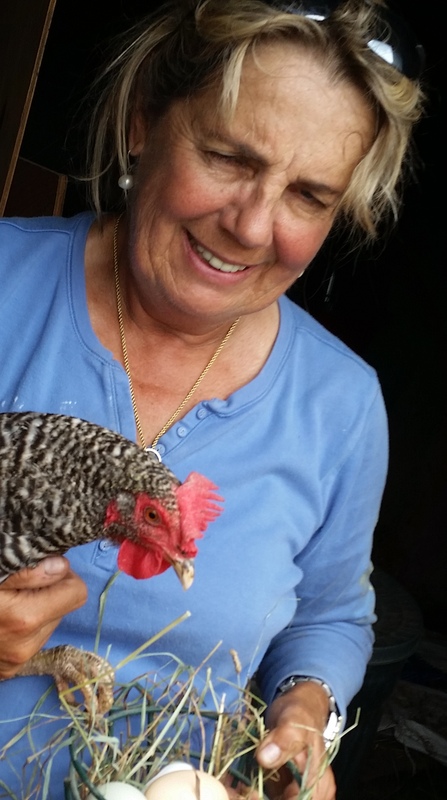 Harriet and one of her chickens. It lays blue eggs! 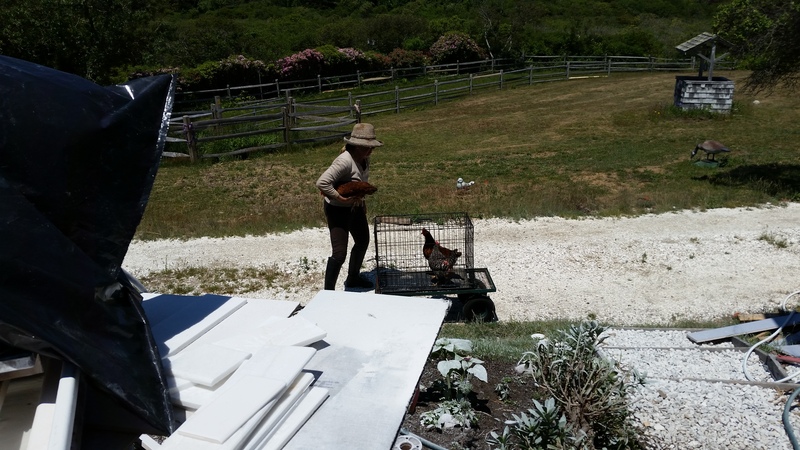 It’s always a fun day at Harriet’s house on Ryder Beach Farm! It may seem like all fun and games, but like I said, Harriet is the only full time human on premises. Though I’ve only heard stories and never met him, Harriet had a wonderful husband, Travis Cresswell who sounded like quite the adventurer whether it be sailing to Antarctica, riding horses all over the world with Harriet, to skiing, sailing and diving, in essence everything she loves doing. Tragically, Travis died in 2007, leaving Harriet to have adventures, run the farm, ski, travel and ride without him. As you read this post it is clear Harriet isn’t sitting around waiting for life to happen to her, but she sure would love to have an equally adventurous Renaissance man in her life. Faint of heart, un-athletic, sedentary, agoraphobic men who expect home cooked meals need not apply, but please feel free to send Harriet a nice man, USPS priority mail would work nicely, or contacting me through this blog. I’m serious here, no fooling! 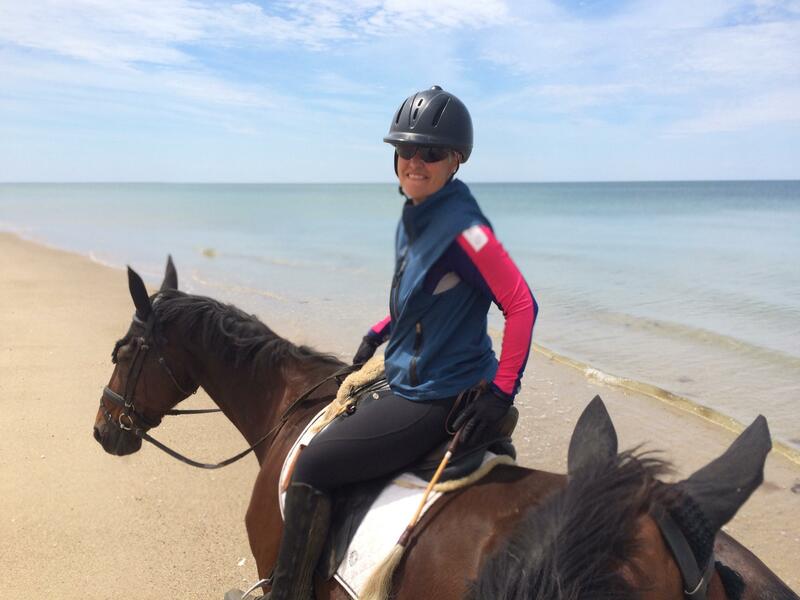 Categories: Cape Cod: 7W's Truro, Diaries | Tags: #Ryder Beach Farm, Bee keeping, Cape Cod, chickens and eggs, Farming, Horseback riding, ryder beach, Sustainable farming, truro massachusetts, Warmblood horses | Permalink.